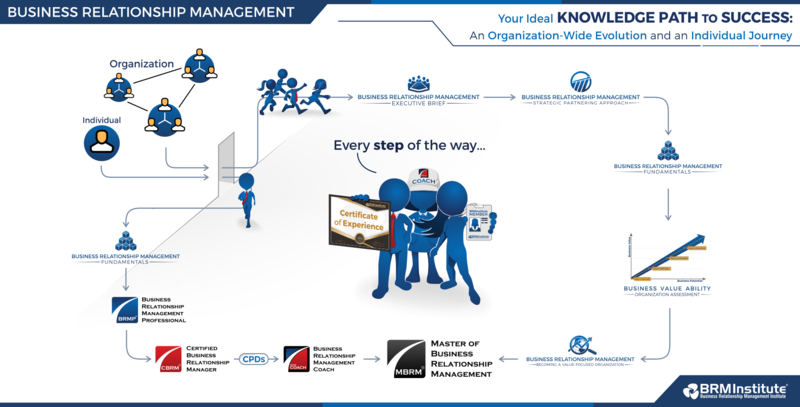 Business Relationship Management continues to advance its efficacy as Certified Business Relationship Manager (CBRM®) now includes an eBook and eLearning option. 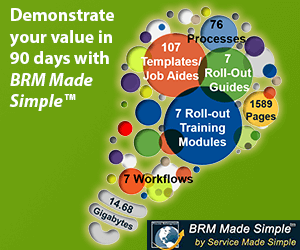 Introduced in 2016, CBRM is available to practicing BRMs and business leaders via in person and online live training. The new eBook and eLearning expand the reach of this valuable knowledge to those who prefer digital copy and/or self-paced virtual learnings. It is an excellent and effective method for individuals wanting to learn and gain certification at their own pace and outside of a traditional classroom setting. The CBRM is a certification for experienced BRM practitioners which acknowledges your practical knowledge attained through training, practice, and experience. CBRM Professionals are recognized and desired by employers because their BRM skills are polished, produce results, and can be engaged help develop others. 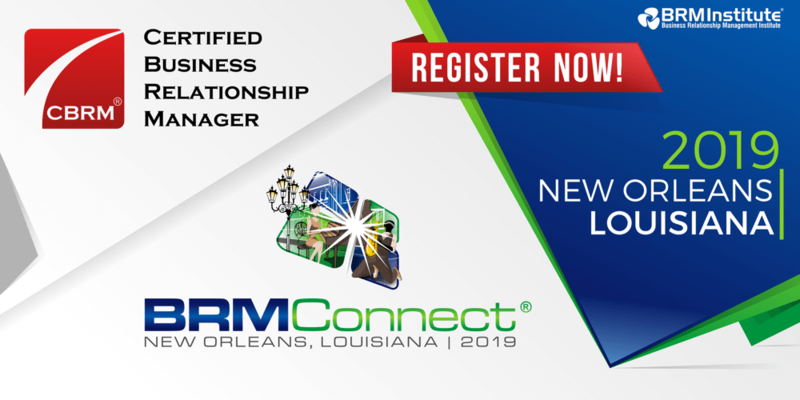 To enroll in the CBRM course and sit for the corresponding certification exam, candidates must demonstrate that they have a solid grasp of BRM by first submitting a copy of their official Business Relationship Management Professional (BRMP®) certificate. CBRM allows BRMP qualified students to take the next step in their development and learn what it means to become a strategic BRM or business partner, fostering effective business value-producing relationships. Learn about CBRM eLearning opportunities here. The CBRM Guide PDF eBook is used in the CBRM training and certification program. Intended for the intermediate-to-advanced Business Relationship Manager, it focuses on advancing to the role of Strategic Business Relationship Manager. As such, the primary focus is on strategic business relationship management, leveraged to optimize business value to the enterprise. You can purchase The CBRM Guide in spiral, perfect bound, and now in a PDF eBook here. A reminder that once you have achieved your CBRM credential, be sure to achieve your Certificate of Experience from BRM Institute by submitting real-world practical application. Learn more about Certificates of Experience or apply here! CBRM is also available in virtual and traditional classroom options. You can find listings for CBRM, BRMP and many of our other learning opportunities around the world by clicking the button below. View listings for courses and workshops around the world. Once you have enrolled for CBRM training, you are eligible for 50% off new or renewal on professional level membership with BRM Institute. Ask your training organization for the discount code at the time of registration. BECOME A STRATEGIC BUSINESS RELATIONSHIP MANAGER ABLE TO DRIVE AND RECOGNIZE VALUE ACROSS THE ENTERPRISE!